This is a super easy and healthy turkey chili recipe. I’m a big fan of comfort food. The Martha Stewart MACARONI AND CHEESE recipe I made for Thanksgiving is still one of my favorites, but this recipe is definitely an old standby for when I’m in the mood for yummy comfort food. 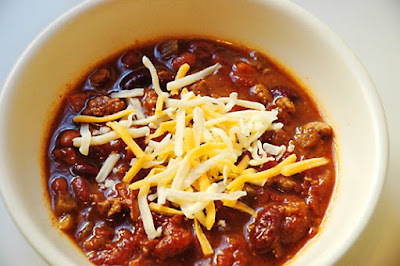 This chili has great flavor from the added dark beer and plenty of kick from the peppers! 1 package of ground Turkey, about 2 lbs. Heat a bit of oil in the bottom of large sauce or stock pot. Lightly brown turkey until it is nice and brown, but not totally cooked. Dump remaining ingredients into the pot and bring to a boil. Lower heat, cover and simmer for 45 minutes or until beans are tender and liquid has reduced and thickened. If liquid is not reducing, uncover and continue to simmer for an additional 10 minutes. Serve with diced onions, sour cream, or cheese!